Los Angeles-based Gabrielle Furlong has three certifications as a Personal Fitness Trainer, Fitness Nutrition Specialist and Orthopedic Exercise Specialist. Pursuing a degree in journalism with an emphasis in urban planning, she likes to use her knowledge to provide information about fitness and nutrition, along with creating personalized meal and fitness plans for the public. Sprinting, or running at a high intensity, will get anyone out of breath -- and quickly. Different paced runs require different breathing techniques, and sprinting is different from other types of runs. It is important to be aware of how fast and frequently you are breathing when sprinting to make the most out of your run. The pace of your run determines the rhythm of your breath. According to Runner’s Connect, breathing rhythms are based on the number of steps you take, compared to your breath rate. 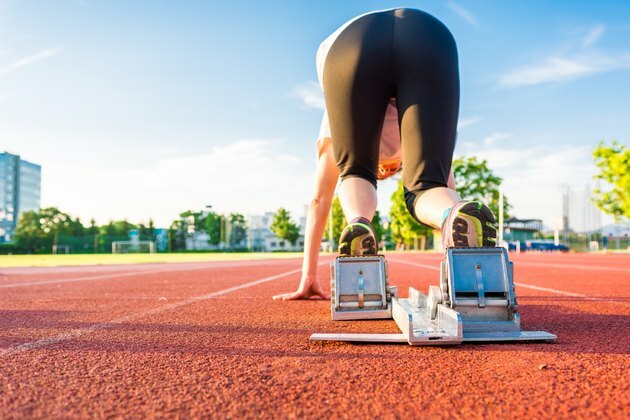 When sprinting, a breathing rhythm of 1:2, which is one step breathing in and two steps breathing out; or 2:1, which is two steps breathing in and one step breathing out. Each of these breathing rhythms contribute to a larger capacity of oxygen being inhaled, which sprinting requires so that you do not tire as easily. The higher the amount of oxygen that travels through your body, the better your body will function while sprinting. The ability to deliver oxygen to your cells quicker helps you run even faster. This is best achieved by breathing using your belly, rather than using just your lungs to breathe while running. With belly breathing, you will use your stomach muscles to help your lungs push the air out, causing your stomach muscles to expand. When you exhale, tighten your stomach muscles, drawing your stomach in towards your spine, flattening it again. Your stomach should rise and fall, as opposed to your chest rising and falling. According to Marathon Guide, belly breathing allows you to inhale more oxygen, while expelling more carbon dioxide, which is crucial for sprinting so that you can run faster and not tire as quickly. Breathing through your mouth, not just your nose, will allow more air to enter your body. Breathing through just your nose leads to a clenched jaw and the tightening of your facial muscles. When sprinting, your entire body including your facial muscles, should remain in a relaxed state, which breathing through your mouth also helps with. With your mouth open just slightly, you will be getting an adequate amount of oxygen into your body for your sprints. Be mindful of your breathing rhythm and pace. According to Runner's Connect, if your breathing rhythm is 1:1 or faster, you could hyperventilate. If your breathing rhythm is less than 3:3, you may not get enough oxygen to your body during your sprints. Sprinting in areas that are not too hot or polluted can make breathing easier.